Oh what a little sweathear, I know you could just eat her up! I'm lovin the kanga too ! 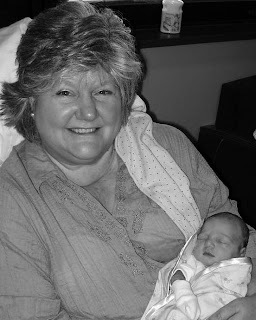 A happy grandma and a very content little girl. What a precious little dot. Love the blanket and burp cloth, very cute roo. I think you need to tell us how you do those burp cloths, for those of us (me) who don't know. Congratulations!! Such a precious little one. I love the burp cloth and blanket. Awwwhh sleep'in in Gram's loving arms. What a lil doll! Pretty neat burp cloth too!! What a wonderful, precious picture!!! And such a sweet little girl! Isn't it so great that we can make burp clothes so pretty. I just always used a cloth diaper. 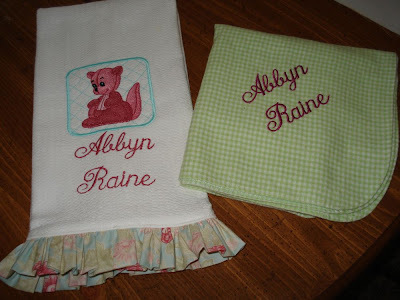 My grandchildren will get nice burp cloths too. One day. Love the last picture...so cute! What a cutie. I think she looks a little like her Grandma.